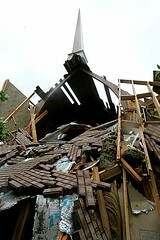 This was the Groves Seventh Day Adventist church, in Groves, Texas – post Katrina and Rita. I was baptized there, twenty years ago. One vespers service when I was ten or eleven years old, the steeple(?) was struck by lightning. It sounded like a truck had rammed the building, and we were all startled and wondering if we’d lose power. There was once a bad car wreck across the street, right in the middle of a church service (or possibly a vespers, or Pathfinders meeting – I don’t remember). Everyone emptied the building and helped pull the hurt people out of the cars and treat them, there in the church parking lot. I remember feeling very helpless about the whole thing. At some point during our time there, the church got a new pastor. He was all right, but his daughter – who was about my age – wreaked havoc on the social structure there. She was one of these oddly aggressive, sexually precocious girls whose behavior made you wonder what the hell was going on at home. And she didn’t seem to understand that we could all be friends; instead, she used gossip, lies, bribery and suspicion to rend asunder the small friends circle that existed — because no one was allowed to be friends with anyone except for her. I hated her with the white-hot passion of a thousand suns, because after she arrived – none of us were really friends, ever again. At Halloween we had a pumpkin carving contest one year. I’d never carved a pumpkin before, but it turned out okay (all things considered). All the kids who entered got “first place” ribbons, which was sweet. A guy named Gene (parent of one of my friends) submitted the coolest pumpkin I’d ever seen — it was the kind you find pictures of on display in playful haunted house windows. Very crazy-professional looking. I was totally in awe; I tried to give him my first-place ribbon but he just laughed and wouldn’t take it. Me and a girl named Eloise used to ditch Sabbath school sometimes to lock ourselves in the sound-proofed nursery, where there was a radio. We’d turn it up and dance around to “Open Your Heart,” the Madonna song popular at the time. We pretended we had kicky black wigs too, and pasties with tassels. It was silly, and fun. My youth group once held a bike-a-thon to raise money for some cause or another. It looked like attendance was going to be low until Rudy — an exquisitely huge man who always wore a ten gallon hat, a belt buckle the size of a platter, and cowboy boots — declared that he too would ride in the event. Everyone was so morbidly curious to see him on a bicycle that we all turned out to ride. So you know. Same as anywhere – good and bad. Since those halcyon days of yore, I’ve more or less left the church and gone my own way … but I still hate to see the place like that.